High-speed, multithreaded print engine handles heavy labeling loads without slowing down. Multi-processor support with load balancing between processors. Multiple LPS's can be used to "divide" the load if necessary. 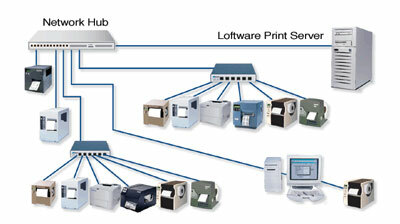 High-speed support for up to 500 target printers across the LAN/WAN and Internet. High-speed input thread is notified of incoming print jobs and launches them instantly, regardless of how busy the LPS is servicing other requests. High-speed printer drivers communicate with the printers in their own native language. Printer output streams directed across the Internet are compressed. Label Formats and graphics are pre-downloaded to the printers, only data that changes between jobs is sent. Printers and labels can be added to the system without the need for shutting down. Runs as an NT service with all applicable security. Print jobs are automatically recovered and restarted in the event of an unscheduled system shutdown. Client programs are notified of system shutdown so that they can take appropriate action. In the event that a client continues to send requests when the LPS has been shut down, all jobs will be printed upon system restart. If a printer is offline for any reason, jobs are queued and printed when the printer comes back Online. Event logging of warnings and errors in the NT/2000 event log. Local serial (COM), parallel (LPT) and Universal Serial Bus (USB) ports are supported. TCP/IP socket connections are supported for network printers on the LAN or WAN. Choice of using the Windows Spooler for small systems or the high-speed Loftware spooler for large systems. Thin On-Demand Print Client allows the prompting of operators for print requests across the LAN or WAN. This program is fully featured and is "thin", which means that no installation is required. Up to 500 thin clients can connect. On-Demand Print Client can also be run in a Citrix, or Terminal Server environment. Applications that can export CSV or XML files can interface the LPS without the need for programming. The LPS can handle up to 500 clients. Host and client programs are printer independent. Automatically handles complex barcode symbologies such as RSS, UCC128, Maxicode with compression, PDF417, MicroPDF, and Datamatrix. Supports a wide range of Windows and Thermal Transfer printers. Fully featured Label Designer makes it easy to design labels. Label Wizard makes it easy to adhere to automotive, healthcare (UPN), and DOD standards. Direct connections to WMS systems from Oracle, Lilly Software, Catalyst International, EXE Technologies, Midguard information systems, Intrepa, etc. Tightly integrated with AS/400 host systems when used in conjunction with a "bridge" from Patrick Townsend Associates. Auditing features for tracking what has been printedConfigurable housekeeping feature for purging old jobs and status information on a periodic basis. Connect to Oracle, SQL Server, Access, Excel, and any other database supporting 32 bit Open Database Connectivity (ODBC). Support for Citrix Metaframe and Terminal Server environments. Print foreign character sets for international labeling requirements. Extensive serial number and date time format support. Automatic data parsing and mathematical calculations. Constrain label design mode to only allow fields that your program knows how to send. WDPING utility for system troubleshooting. Control Panel Applet for configuring all aspects of LPS. Java based servlet for connecting across the Internet. Extensive printed as well as on-line documentation. "World class" Technical Support and System Analysis. Your purchase of a Loftware Product includes an Annual Support Contract. This contract is renewable each year and extends the return on your investment, with on-going FREE upgrades of your Loftware Software for one full year, plus unlimited calls to our technical Support Call Center! Loftware is committed to backing its software with world-class support. Our trained Systems Analysts are also ready to answer any questions you may have about planning and implementing your labeling system. Call 207-363-3195 for a FREE consultation!